Calling all alums! 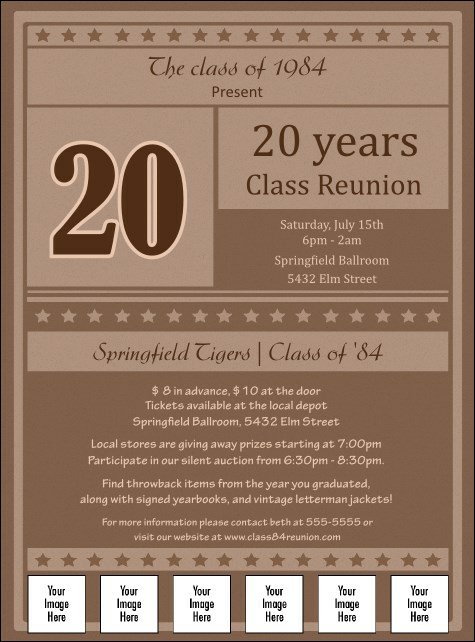 Incorporate the Reunion 2 Image Flyer into your event marketing plan and see attendance soar. Fill its several lines of customizable text with your event’s details and add six of our own images in minutes. We’ll then custom print in color on quality card stock at a budget-friendly price and ship. Size measures 8.49" x 11.46"
Find customizable flyers, posters, event tickets, and more on TicketPrinting.com.